Preschoolers at The Barbie School work with island artist Liz Lewis each year to make clay creations. Thriftway. Those who wish to donate can also send checks to the PTSA at P.O. Box 2364, Vashon, 98070. Volunteers are also needed and should contact Manette Arteaga, drive coordinator at 280-9673. Families who would like to receive items can do so from 11 a.m. to 1 p.m. and 5 to 7 p.m. Wednesday, Aug. 29, at the Vashon Maury Community Food Bank at Sunrise Ridge near Granny’s Attic. A Spanish interpreter will be on site. “It’s open to anyone who needs a hand getting the family equipped for the school year,” said Jackie Merrill, PTSA’s president. What to donate? Backpacks are in great demand, organizers say. Other items include safety scissors, college-ruled paper, calculators, glue sticks, rulers, pens and pencils. Publisher .................................................... Daralyn Anderson Editor ........................................................... Natalie Johnson Section design and cover design ......................... Nance Scott Advertising ................................................. Daralyn Anderson Island Child is published biannually by Sound Publishing Inc. No part of this publication may be reprinted without the permission of Sound Publishing. For additional copies, call (206) 463-9195 or email publisher@vashonbeachcomber.com. ©2013 Sound Publishing Inc. Note: As of press time, the dates in the School Calendar on page 7 are set. Throughout the year, however, some may change. 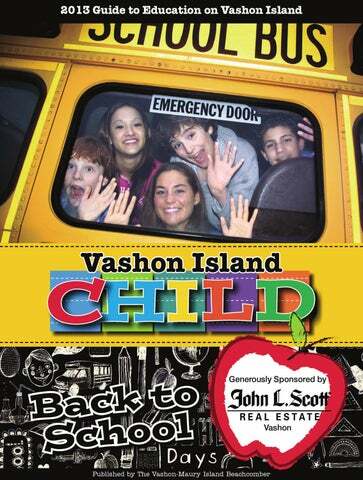 Confirm dates by calling the Vashon Island School District office at 463-2121 or visiting www.vashonsd.org. also hosts a large number of events at all three schools — including family science nights, career fairs, a field day, recreation nights, staff appreciation week, a film festival and book fairs. 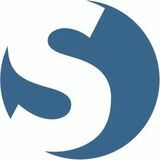 And for those who have kids in elementary school, consider kicking off the school year with the PTSA’s icebreaker, a social event at Chautauqua Elementary School from 2 to 3 p.m. Thursday, Aug. 29. Enjoy icepops, meet your child’s teacher and get to know other parents. Contact PTSA president Jackie Merrill at ajmerrill@comcast.net. Chautauqua Elementary School Our school culture continues to promote respectful engagement in regard to self, others, learning and the environment. Children have been recognized for their kindness towards others, their commitment to keep our environment safe and inviting and for striving to do their best academically. We are proud of our students and their leadership throughout the school. Many of our children embody the habits of mind that great leaders possess: empathy, persistence, cooperation, responsible risk-taking, humor and so much more. Kindergartners in Pam Haulman’s kindergarten class show off their enthusiasm one day last spring. colonial America through the children’s living museums and their fine writing. They culminated a study of Asia with beautiful haiku poetry and stunning performances that demonstrated deep knowledge. Our teachers took on some fantastic professional development opportunities this year. They worked with a math facilitator from the University of Washington all year and into the summer. Also, they worked side by side with Trish Howard and Barbara Gustafson as they delved deeply into the new life sciences curriculum. Throughout this year, our staff learned from each other as they explored the best ways to teach math, reading and writing skills, including and beyond the curriculum. Teachers share their incredible knowledge and skills with one another, making our school a place where every child has a chance to learn to his or her highest potential. Chautauqua students display whimsical art they made as part of a collaborative unit integrating their science and art lessons to learn about birds. Overview As a learning community, McMurray Middle school prepares its students during the transition from elementary school to high school. We are committed to helping students achieve their fullest potential through dynamic instruction, challenge and unique learning activities during the significant sixth-, seventh- and eighth grades. We appreciate the diverse learning styles and abilities of middle school students and are responsive to their developmental and social characteristics. As a middle school, we recognize the intellectual, creative, social and emotional nature of young adolescents. We challenge each student to master essential academic skills, to acknowledge individual potential, to identify his or her strengths and challenges and to explore possibilities while developing a sense of respect and responsibility for themselves and peers. McMurray’s program is a blend of core academics, exploration and skill building that helps create a community of engaged learners. Challenge, exploration, acceptance and support are all part of the McMurray program. These aspects are fostered by students and staff that work to establish a building climate of positive communication, collaboration and cooperation. The McMurray seventh-grade Math Is Cool team strikes a pose at the Math Is Cool Seattle regional championships last fall. Both McMurray’s seventh-and eighth-grade teams went on to compete at the state competition. lenging each other toward academic excellence, particularly in reading and math. Our school climate was enhanced in many ways through our student mentors, student leadership, homeroom advisory and student-led conferences, positive recognition and cultural enrichment programs. We strive to engage students, families and the community. We enjoy the support of key volunteers, enhancing students’ experience in a variety of settings and helping to make our school a special place for learning. Additionally, student-led conferences and online family and student access to our database system continued with great success. Our entire school participated in Community Day at the beginning of the year. This day focused on many homeroom team-building activities designed to build community, respect and involvement throughout the school. High percentages of our students participated in and excelled in the various activities McMurray offers. All of our sports teams received WIAA recognition as distinguished and outstanding scholar-athletes. We continued to collaborate with a variety of partner groups, such as PTSA, Artists in the Schools and Vashon Youth & Family Services to support our students’ success. Reading and math assessment and intervention, prevention activities and student mentors were very successful in helping students reach their fullest potential. Eighth-graders also took part in 10 different experiential learning programs during Exploratory Week in June with outstanding achievement. Goals for the year Student engagement, literacy, critical thinking and academic excellence and growth for all students continue as our highest priorities. Developing a positive, respectful, and inclusive school climate will be emphasized throughout the year in our homerooms and throughout the school. Developing positive partnerships with students, home and the community through a variety of outreach and communications will also continue to be a high priority. Several eighth-grade McMurray students enjoy a moment with Miss Washington last fall in Yakima at the Washington State Prevention Summit. The annual summit is intended to reduce substance abuse and other destructive behaviors. Introductions It is a great honor to begin the year as the new principal of Vashon High School, home of the Pirates! My family moved onto the island at the beginning of July and has been warmly welcomed by not only the weather, but the characteristic friendliness of the island. This school year will be a year of introductions for the high school, including new staff, new students, new classes, a new schedule and the amazing experience of opening a new building. We will continue to blend a strong academic program with vibrant extracurricular experiences this coming year as we equip students to be prepared for 21st century challenges. Students performed in last year’s musical “Into the Heights“ as a culmination of a musical theater elective. High school football players carved jack-o-lanterns for the Vashon Island Coffee Roasterie as a team. Members of the VHS Amnesty Interact club participated in the Seattle Aids Walk last fall. peted in the state competition, earning a perfect 1 (Superior) rating. Senior Cole Devereau qualified for the state golf tournament for the 4th time in 4 years and Parker Scott qualified for Tri-District. The VHS baseball team qualified for the state competition, tennis singles Victoria Zaknich and Taryn Mulvihill both qualified for State, Cate Stackhouse and Lili Stenn placed third in the state debate tournament and the boys’ wrestling team qualified athletes to compete in post-season tournaments as well as placing first in the Nisqually League. Our students and community also demonstrated the strong connection and support we share in responding to the passing of current and former students this last year. There are no easy ways to deal with the loss of part of our community, and our students, staff and parents were quick to be there for one another in times of need. Educational alternatives at VISD online classes this year in geometry, chemistry, Spanish and career exploration. The use of online courses is helpful when the subject — like chemistry — is more challenging to do as a homeschool student. We also offered all parents more opportunities to use webbased and subscription curriculum to supplement their primary program of study. • Community-building and student/ parent support activities included our fall orientation, winter wreath and ornament-making workshops, test Tips and strategies workshop and the endof-year pool party and potluck. • Eight seniors graduated with FamilyLink diplomas in June. FamilyLink FamilyLink is a community of homeschooling families, teachers and staff who are committed to providing quality education in a way that acknowledges the individual interests and learning styles of each student. FamilyLink teachers partner with parents to create learning plans, develop teaching strategies and learning activities, find curriculum and access district services. In addition to teacher support, we also offer enrichment classes, family-friendly activities and events, a resource library and computer lab, regular communication via our website and monthly Community Connection, the opportunity to earn a high school diploma and an educational support fund for each student. Plans for this year FamilyLink plans to offer regularly scheduled enrichment classes and Courtesy Photo workshops for students in grades K Laura Erickson displays a wreath she made at a wreath-making workshop. Her though eight, including science, language arts, writing and art. High school mother Heather and brother Evan are in the background. students will have the opportunity to take physical science with teacher Jim their lab requirement in the biology lab class taught by Gilmour. We also will continue to publicize the wealth teacher Jim Gilmour. In the visual arts, students made of enrichment activities and events available on mosaics and jewelry with teacher Katie Lewandowski Vashon in our newsletter and on our website. and raku pottery with artist Liz Lewis. They made FamilyLink is housed in two portables on the encaustic photographs with photographer Ray Pfortner and exhibited their work at the Two Wall Gallery during Vashon High School campus. For more information First Friday in May and June. about FamilyLink enrollment and services, contact us at 463-9171 ext. 503 or visit www.vashonsd.org/links. • Some of our high school students took state-approved students are encouraged to develop courses that are experiential or community-based. For example, one student who excels in blacksmithing was invited to demonstrate his skill to one of the career and technical education classes at Vashon High School. He also displays his creations at the Vashon Market. Another student used her graphic design and Photoshop skills to create the poster for the Day of Silence event at Vashon High School. Still another student with an interest in poetry was chosen to be a Junior Vashon Poet Laureate this year. they choose not to attend, but most embraced the offer and were able to receive additional assistance on their work. • StudentLink honored two graduating seniors at our Celebration of Graduates in June. Plans for this year We expect to hire an additional teacher this coming year as enrollment in StudentLink increased from 17 to 25 students. The StudentLink classroom is located in the K Building of the Vashon High School campus. • We are fortunate to have tutor Daphne Purpus continue to work with our students Tuesday through Thursday from 10 a.m. to noon. Most students use her help in math, but she also helps with writing and general problem-solving. She is another caring adult on whom our students can rely, and we are very lucky to have her. • This year, we offered students the opportunity to be in the StudentLink classroom at least three hours per week, in Courtesy Photo addition to their one-hour meeting with teacher Nan Hammett. Volunteer tutor Daphne Purpose is ready to help students Ethan Albers, Keirsten Allen There are no consequences if and Lily Robinthal. COMMUNITY SUPPORT Despite state funding, Vashon schools still need support from the community to help them thrive. Here are a few examples of programs that support public education on Vashon. The Vashon Island Public Schools Foundation The foundation was created in 2010 to bridge the gap between state funding for education and what the Vashon Island School District needs to maintain quality programs. Due to the generosity of island businesses, community members, school families and staff, the foundation has raised an average of $400,000 annually for the district. But the foundation’s goal is not to respond to yearly funding crises, Superintendent Michael Soltman said. Its purpose is to help sustain a quality school district. Increasingly, he says, it’s important that islanders see education as a public-private partnership. Many districts benefit from additional private funding; there are 32 school foundations in Washington State. The foundation is a nonprofit governed by a 12-member board. Foundation funds help keep teaching positions — striving to give all students the tools they need to thrive. For more information, visit www. vashonschoolsfoundation.org. Partners in Education Vashon Partners in Education, or PIE, is an all-volunteer organization that enriches the learning environment at Vashon’s public schools by funding creative programs and innovative educational materials. Every year, with funds donated by the community, it awards more than 40 grants. Last year’s grants included Shakespeare DVD’s, several field trips, including the eighth- grade touring our state capitol and tricycles for the preschoolers. PIE holds several fundraising events, including the annual phone-a-thon, which will be held on Oct. 8, 9 and 10 this year. Contact president Ingrid Petersons at Ingrid.m.petersons@comcast.net or visit www.vashonpie.org for more information. The Vashon Community Scholarship Foundation This community-based foundation supports Vashon High School graduates who seek support in their post-high school educational efforts. Supported by Vashon organizations, businesses and individuals, the foundation handed out $115,000 to 80 graduates last May. The foundation’s biggest fundraising event is a spelling bee for adults and teens, called Spell It! The 2014 spelling bee will be held in late January. To learn more about VCSF, contact Barbara Gustafson, this year’s co-president, at 463-1638. Carpe Diem student Sadie Liebo plays outside the school. Enrichment programs and after-school activities Vashon offers a variety of opportunities for young children through teenagers to stay active. Below is a sampling of ideas. The program is open to teens ages 13 to 19 and in grades eight though 12. Novice rowers will learn the basics, and returning rowers will continue to train for technique and fitness. Those interested in being coxswains are encouraged to sign up as well. Regattas require off-island travel on weekends. Registration is under way, and the fall season starts with an all-day camp from Aug. 26 to 30. Regular afterschool practice starts Sept. 3. The fall season focuses on long distance races and concludes in November. Website: www.vashoncrew.com and click on the Juniors tab. Vashon Allied Arts offers a variety of offerings throughout the year, including musical theater, above. the island’s public schools. This class is for students in first-grade and up, and adults are welcome as well. The class is taught with a storytelling method with skits and songs. Holly Boaz, one of Vashon’s opera singers, will join the group as a choir director. The class and choir meet from 9 to 11 a.m. at La Petite Etoile, located at Bethel Church. For more information, email Aristy Gill at lapetiteetoilevashon@yahoo.com. PRESCHOOLS, DAYCARES AND OTHER AFTER-SCHOOL PROGRAMS The Barbie School: Preschool and kindergarten. Contact Zoe Cheroke at 463-3135. Cedarsong Nature School: Outdoor preschool. Visit www.cedarsongnatureschool.org. Chautauqua Early Childhood Program: Preschool for children with developmental delays and their typically developing peers. Contact Gillian Callison at 463-2882, ext. 401. A Child’s Garden Montessori: Preschool and kindergarten. Contact Heather Baldwin at 7539924 or www.achildsgardenmontessori.com. Creative Preschool: Contact the school at 463-2166 or see www.creativeps.org. El Gato con Botas: Full-day, state-licenced Spanish bilingual daycare. Contact Sarah Bunch at 473-0445 or see elgatopreschool.blogspot.com. Homestead School: Multi-age learning community. Contact Dana Schuerholz at 463-OWLS or zeek@riseup.net. Kids Are People Too: Preschool and extended care. Contact Danielle York at 463-2610. Klahanie School: Year-round Montessori preschool program. Call the school at 491-9465 or see www.klahanieschool.org. La Petite Etoile: French language school. Contact Aristy Gill at (206) 304-4903 or see vashonfrenchschool.blogspot.com. Little Tree Montessori: Preschool and kindergarten. Contact Teri Tipton at 463-9249 or see www.littletreemontessori.com. Love and Laughter Drop-in Preschool: Preschool and licensed daycare. Contact Jenny Mickelson at 529-5124 or see www.loveandlaughterpreschool.com. Starbreak Adventure School: Preschool and kindergarten. Contact the school at 463-6277 or see www.starbreak.org. Vashon-Maury Cooperative Preschool: Preschool. Contact the school at 463-2779 or see www.vmcp.org. VYFS Vashon Kids: Before and after school care for kids ages 5 to 12, as well as care during school breaks. Contact Dalinda Vivero at 930-2592 or see www.vyfs.org. The Beachcomber’s spring issue of Island Child, published in April, contains more information about day care and preschool programs. Drop by the office for a copy.